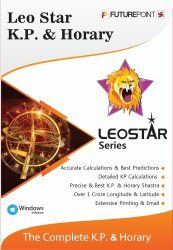 This software contains KP & Horary modules of Leostar series of astrology software. KP & Horary systems are best and most popular for getting answers for the queries of querist. To understand the benefits of KP software we must understand that KP system is used for minute calculations and predictions. Krishnamurti system of astrology is difficult to calculate, but leostar Software makes it very simple. KP System gives the formula of sub-lord for getting minute predictions. The main difference in degrees in closet charts comes from the sub-lords of houses. The slight difference of few minutes change sub lords of houses. So KP system advocates the paramount need of considering these Sub-lords. Most of the astrologers use this KP software to get answers for their questions. Some astrologers like KP system for determining the timing of an events like marriage and employment etc. Leostar Horary software is used for getting answers for your Prashna. Leostar Horary has already given a list of questions from which you can choose your question. Otherwise your new questions associated with the house and planet can be saved. Based on the study of house and planet position your answer with the probability of event along with probable timing shall be answered in percentage. This answer shall help you know the answer for your question. In addition, if your question does not fall into any category of this software then you can add questions. But this will happen only if you shall also mention the planets and houses related to your question. The maximum planets and houses can be three and minimum one. This software includes all KP calculations that is KP Planet, KP House, Significator element, House Significator Element, Lordship, KP Lagna chart, KP Lagna Chalit, KP Bhava chart, KP Navamsa chart, KP Bhava (house) Degree. KP Karkattwa detail - planet and Nakshatra position, lord, sub lord, the position of the planet in the constellation of the planet. Vimsottari Dasha, Transit - Sun, Moon and Ascendant. Planet Karkattwa chart & Krishnamurti Bhava Karkattwa chart. Horary astrology - Horary astrology chart details. Horary astrology charts - Ascendant Chart (Question Chart or Prashna Chart), Lagna Chalit, Moon Chart, Navmansha chart. Questions scriptures state - Vimshotri. In horary astrology Dashas are used for the calculation of fructification of an event. leostar software gives the facility of using vimshotri and yogini dasha. Calculation and detailed answer of questions on the basis of horary astrology. Many generally asked questions in the Leostar database with various categories - like Business, Children, Competition, Court case related, Disputes, Educations, Gains, General, House, Health, Job, Land, Litigation, Loss Related, Lost & Found, Money, Occupation, Peace, Power, Profession, Property, Relations, Respect, Success, Travel and Vehicle. The modules that one gets in Leostar Standard software are Teva, Astrology, KP, Horary, Mundane & Tables.